Travellers to Oman will have to apply in advance for a Tourism Visa online as Royal Oman Police announces new visa procedures. Previously, most Travellers could obtain a visa on arrival, either at an airport or border post, though the e-visa system launched last year. Until now, it allowed them to choose between the 2 types of application. The Omani government now announced that effective immediately, applications for tourist visas, including express visas, can only be made online through http://evisa.rop.gov.om, “and will not be received at the visa service desks”. 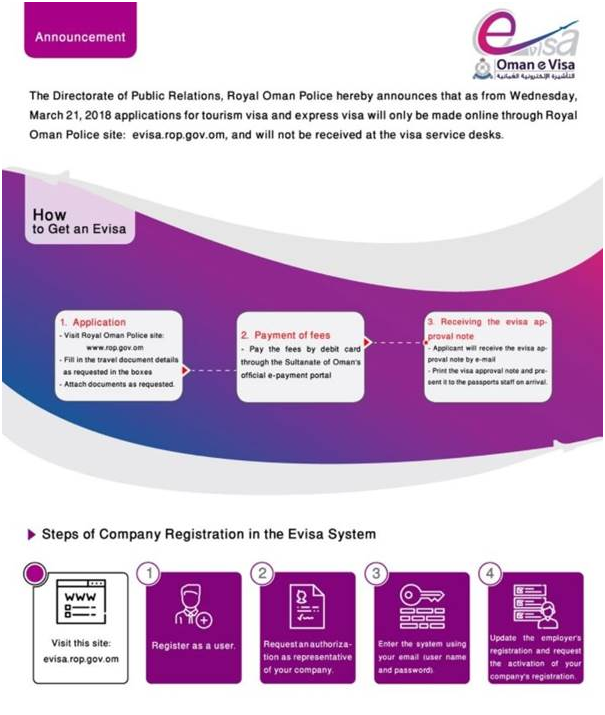 According to the Royal Oman Police website, to obtain an e-visa, visitors must register with a username and password, and then select their choice of visa before payment.